Per the plan, the spacecraft currently is in data-gathering mode and not in contact with flight controllers at the Johns Hopkins University Applied Physical Laboratory (APL) in Laurel, Maryland. Scientists are waiting to find out whether New Horizons “phones home,” transmitting to Earth a series of status updates that indicate the spacecraft survived the flyby and is in good health. The “call” is expected shortly after 9 p.m. EDT tonight. New Horizons’ almost 10-year, three-billion-mile journey to closest approach at Pluto took about one minute less than predicted when the craft was launched in January 2006. The spacecraft threaded the needle through a 36-by-57 mile (60 by 90 kilometers) window in space — the equivalent of a commercial airliner arriving no more off target than the width of a tennis ball. Because New Horizons is the fastest spacecraft ever launched – hurtling through the Pluto system at more than 30,000 mph, a collision with a particle as small as a grain of rice could incapacitate the spacecraft. Once it reestablishes contact Tuesday night, it will take 16 months for New Horizons to send its cache of data – 10 years’ worth — back to Earth. New Horizons is the latest in a long line of scientific accomplishments at NASA, including multiple rovers exploring the surface of Mars, the Cassini spacecraft that has revolutionized our understanding of Saturn and the Hubble Space Telescope, which recently celebrated its 25th anniversary. All of this scientific research and discovery is helping to inform the agency’s plan to send American astronauts to Mars in the 2030’s. APL designed, built and operates the New Horizons spacecraft and manages the mission for NASA’s Science Mission Directorate. SwRI leads the mission, science team, payload operations and encounter science planning. New Horizons is part of NASA’s New Frontiers Program, managed by the agency’s Marshall Space Flight Center in Huntsville, Alabama. 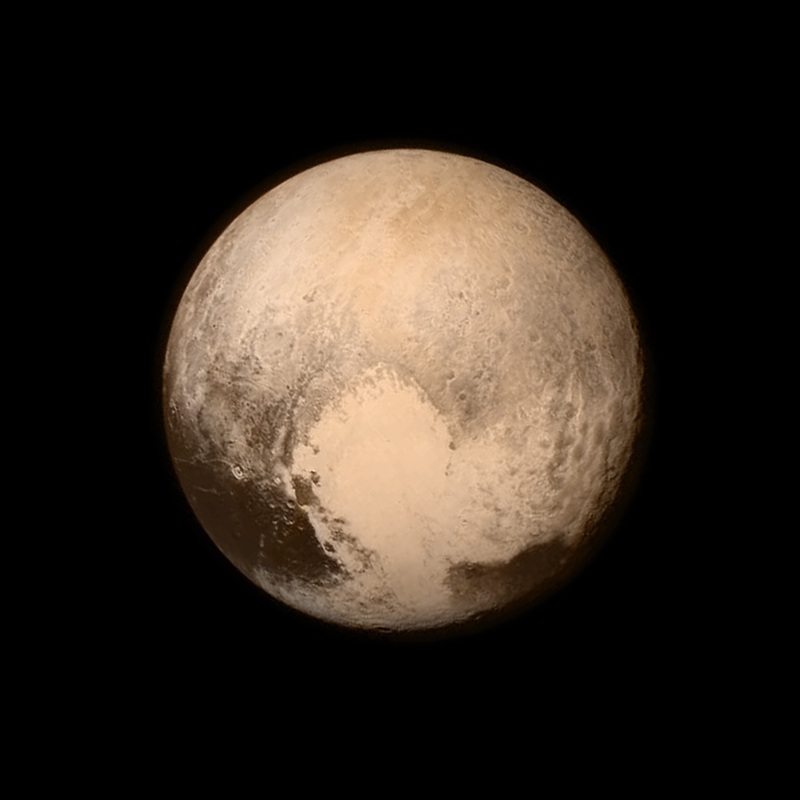 Three billion miles away, Pluto has sent a “love note” back to Earth, via NASA’s New Horizons spacecraft. At about 4 p.m. EDT on July 13 – about 16 hours before closest approach – New Horizons captured this stunning image of one of Pluto’s most dominant features. The “heart,” estimated to be 1,000 miles (1,600 kilometers) across at its widest point rests just above the equator. (The angle of view displays mostly the northern hemisphere.) The heart’s diameter is about the same distance as from Denver to Chicago, in America’s heartland. Pluto nearly fills the frame in this black and white image from the Long Range Reconnaissance Imager (LORRI) aboard NASA’s New Horizons spacecraft, taken on July 13, 2015 when the spacecraft was 476,000 miles (768,000 kilometers) from the surface. 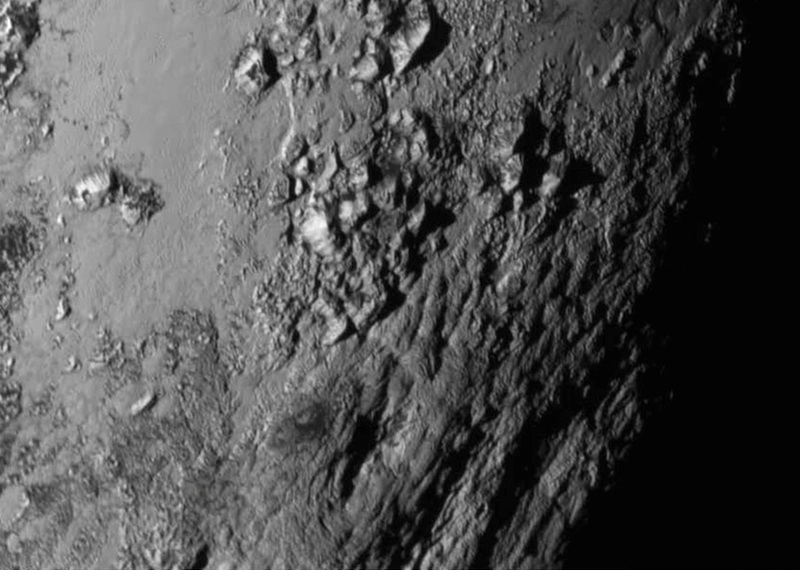 This is the last and most detailed image sent to Earth before the spacecraft’s closest approach to Pluto on July 14. New close-up images of a region near Pluto’s equator reveal a giant surprise — a range of youthful mountains rising as high as 11,000 feet (3,500 meters) above the surface of the icy body. 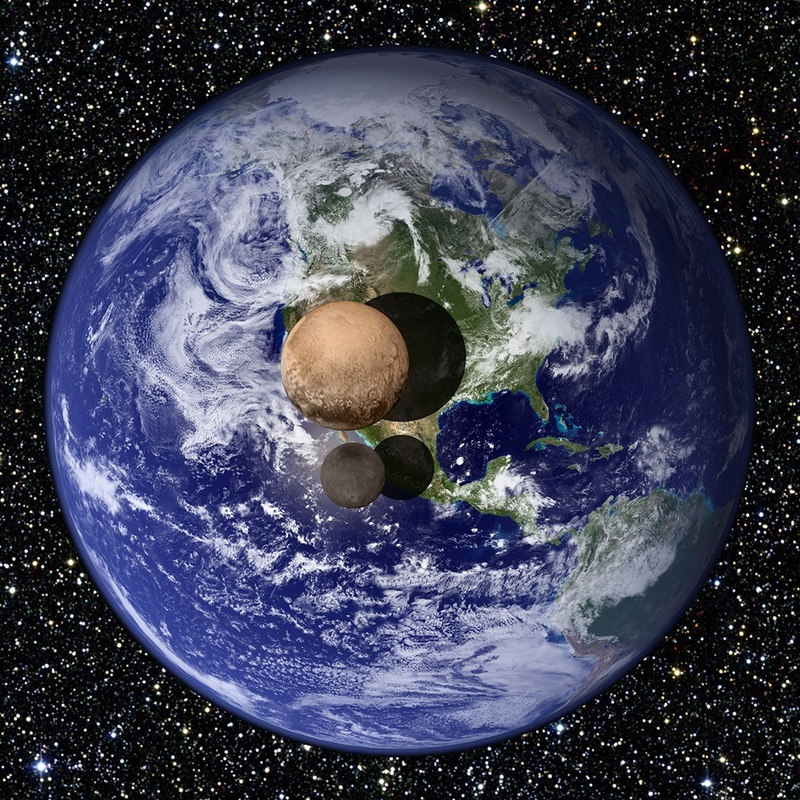 This animation combines various observations of Pluto over the course of several decades. The first frame is a digital zoom-in on Pluto as it appeared upon its discovery by Clyde Tombaugh in 1930 (image courtesy Lowell Observatory Archives). The other images show various views of Pluto as seen by NASA’s Hubble Space Telescope beginning in the 1990s and NASA’s New Horizons spacecraft in 2015. The final sequence zooms in to a close-up frame of Pluto released on July 15, 2015. NASA officials and team members of the New Horizons mission to Pluto participate in a status update of the spacecraft and its suite of instruments prior to New Horizon’s historic flyby of Pluto on July 14. The news briefing was broadcast from Johns Hopkins University Applied Physics Laboratory (APL) in Laurel, Maryland, site of the mission operations center. History in the making ….